Wikipedia is a free encyclopedia which in theory is the product of thousands of readers contributing freely their own knowledge and expertise. Certain controversial subjects have however apparently been locked to prevent outsiders from amending the entries further without a consensus of a panel of self-appointed experts. One such subject is the British writer David Irving, on whom universally hostile entries are to be found in every language version of Wikipedia; it is no surprise to find that there is one community behind the universal effort to smear him, as Tom Holzel, one of the more objective outside editors, reports. He provides here typical exchanges that he has had with rival editors, who instantly destroy and delete whatever positive changes he makes to the David Irving entry. 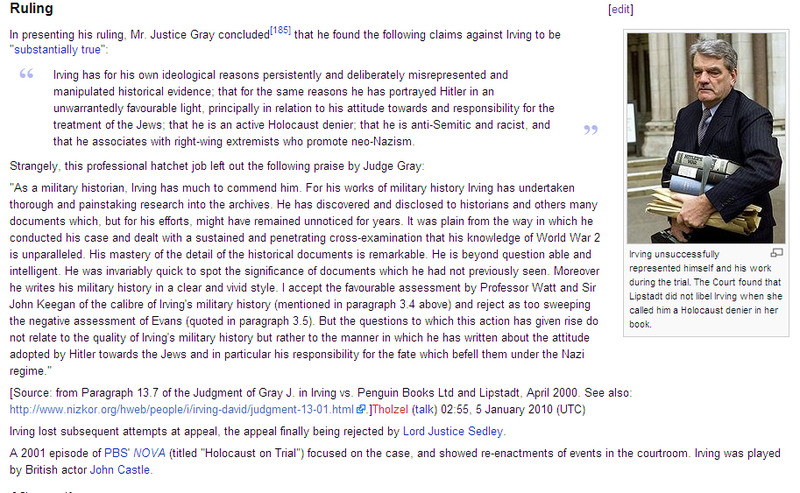 TOM H. sends me an image [above; click image to enlarge] of the updated Wikipedia entry into which he has inserted the fine words of praise for me as an historian, uttered by Mr Justice Gray in his April 2000 Judgment, which the press mysteriously never quotes: "It usually takes them [the Wikipedia zealots] about fifteen minutes to discover that their turf has been disturbed. We'll see how they try to weasel it away." I reply: "I will post that image on my website [above], if 'they' try to take it down. Please keep me closely informed. As for the [Wikipedia] photo caption [above], it does not mention that the Judge agreed that in several points Lipstadt had lied in her book -- e.g. claiming that I consorted with Hizbollah terorrists, that I have a life size portrait of Hitler in my study, and that I stole or damaged the microfiches of the Goebbels diaries in the Moscow archives. Under Section 5 of the UK Defamation Act, these smears however were considered outweighed by the highly damaging 'Holocaust denier' libel which claim by me was not sustained. I wonder if she removed the libels from later editions?" I will gladly answer these questions, but I must say, your answer takes my breath away. 1) This is not an encyclopedia article. It is text proofing taken to a high art. Every point made by the "article" is there to denigrate -- not describe -- an historian of considerable merit in his field. After using 5,300 words of ten historians criticizing Irving's professionalism, I try to add a single paragraph by Justice Gray (whom you quote liberally when it suits you) to give counter evidence that essentially negates much of these complaints against Irving -- and you find that single 211 word paragraph by this expert too long??? 2) This article is a professional hatchet job because it has been produced not by an amalgam of contributors as Wiki contributions are supposed to be created, but by a cabal of religious zealots whose entire interest is to besmirch David Irving. Wiki contributors are specifically told not to contribute if they mind being challenged and contradicted. But there is no warning that certain sites like this one are off-limits to contributors, and which is watched over by a secret priesthood that has taken over complete control of the entire article. Not kosher! Further evidence of its professional single-source construction can be gleaned by comparing it to a similar article, the one on "Holocaust denial." Here we find the exact same construction -- liberal quotes by experts, a lengthy footnote list, references, etc., etc. A really professional job, and by such coincidence, exactly of the same ilk as the Irving article. 3) You continually come back to the same uncivil tactic: "Are you saying (insert something I did not say into my mouth) because if you did (insert threat)?" How can we discuss Irving if everything anyone says who disagrees with you is uncivil, and only what you say, is permissible. It is looming censorship of the worst type. 4) Now that I have answered your questions, perhaps you will ask the question that you have coolly dodged for several days now: What is Holocaust denial? If you cannot even answer that -- and you have used the usual tricks to not do so -- not relevant, see another 10,000 word article we wrote -- how can you claim Irving is one? Most of the claims in the article are innuendo, a mish-mash of alleged anti-Semitism (is anti-Semitism Holocaust denial? ), and massive guilt by association (it is unbelievable how many Nazi portraits grace a biography of this Englishman). Of course you get away with this because you never say what Holocaust denial is. Or put another way, it's whatever you say it is, plus whatever critics you've lined up say it is. It is not an answer to say he lost at a trial. It is not an answer to say he sued and not the other way around, as if being accused of being a Holocaust denier was in the same league as being called daft. Holocaust denial is a crime in many countries, so calling Irving one -- without having to say what that means -- is a terrorist act. If I were to call you a child molester, I suspect you would sue me. Then you would be doing the suing, just as Irving had to do the suing, to try to clear his name. So I believe you are absolutely wrong in refusing to allow that short quotation by Justice Gray in the article. I find it utterly incomprehensible that you can blithely brush-off this insertion of trenchant counter evidence by a neutral authority just because his expert testimony happens to negate much of what your article tries to put over on the public. That is exactly what Wikipedia is supposed to allow. I sympathise with them but only up to a point. The quote [from Mr Justice Gray's Judgment] was meant to clarify one issue, namely the oft repeated argument that "David Irving is not an historian." You over-egged the cake. Their highly paid ($500,000) professional expert Professor Richard Evans stated so explicitly in his evidence. On this point he was emphatically contradicted by the Judgment. Hence the importance of the quote. Also: the Judge found that Lipstadt did lie about me on important matters (Hitler painting, Hizbollah ties, Goebbels microfiches). Try again! WELL, as you can imagine, you are right -- I was completely and professionally rebuffed by the cabal of ideological zealots who run Wikipedia. NOTHING I could suggest was considered acceptable. When I pointed out that 80% of the commentary about you was negative and 4% positive compared to 34% negative for the bio of Josef Stalin, this was considered irrelevant and certainly no sign of bias. I was duly banned for "Repeated attack on Jews," even though the complaint in the discussion section was that I was attacking the editors. And, that I had no idea of the religion of the editors. How I could be guilty of attacking Jews if they were not Jewish was never made clear. It is a masterpiece of dissimulation. But, subsequent inquiries about whether I could make a case against the editors made me realize that the organization has been taken over by Talmudic scholars who will always find fault with your argument, and are blind to their own faults. Any way, I enjoyed the battle for the sake of freedom of speech. I was foolish to think that this modern innovation would have any effect on an entrenched, ancient prior philosophy. "The Jewish Internet Defense Force (JIDF) is a pro-Israel advocacy organization which shares news and information to members and supporters through email, Facebook, YouTube, Twitter, Myspace, Digg, and other popular areas of the Internet... For the most part, however, Facebook's response was less clear-cut, according to David, a leading JIDF member who asked that his last name to be withheld, citing repeated death threats he and other group members have received by email since their actions became public." David Irving writes: I suspect that "David" has himself written the whole heroic page. Who can out him? Photo, name, address, phone number, e-mail? The same nasty tactics his ilk use against their opponents -- plus of course the pepper spray, baseball bat, black cladding,and ski masks which they use but which most of us historians seem to find dispensable.